Avon is one of the few "Signature" names in Vintage Jewelry that is affordable, wearable and collectable! This Necklace and Earrings Set is signed with both "Avon" and "SH". 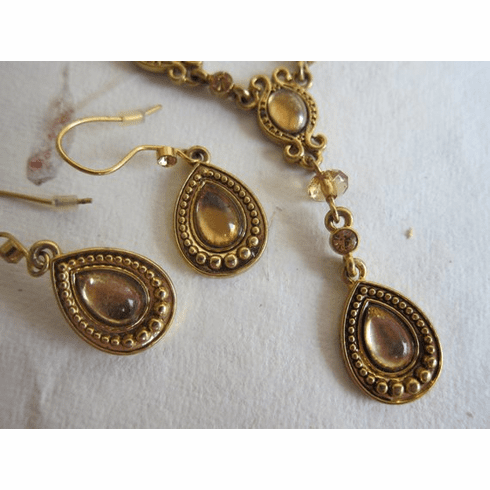 Teardrop shaped glass Cabochons are surrounded by Gold Finished Brass Pendants. Smaller Navettes link together Gold Finished Brass Chain, Bezeled Glass Rhinestones, and Faceted Glass Rondelles. Size: Finished Length of the Necklace is 16" and there is a 3" extension chain (for a total of 19" of length). The centre drop adds 1-1/2" to the bib length. Earrings have a Drop Length of 1-1/2". Condition: There are areas on the chain where the gold has worn off and there is some discoloration (probably from perfume). The Lobster Claw Clasp also shows wear. The earrings look unworn. Additional photographs are available. Please send a note. Markings: Necklace and both earrings are signed "AVON" and "SH"
Payment Options: Paypal or, choose "Bill Me" and I will send a Square Invoice.